Could Panini UK publish Metal Hurlant? When Panini UK lost the rights to originate Marvel Comics stories, many British comic creators and fans mourned the passing of an era, stretching back to the 1960s when British companies put their own spin on some major comic legends and characters. Many wondered if Panini would continue originating comics in the UK - outside of its junior titles and Doctor Who Magazine - but now an intriguing possibility presents itself with the recently-announced launch of the Panini Media unit, which operates as part of The Licensing Machine and is focused on the TV distribution arena. World Screen reports that Panini Media has a catalogue that spans sci-fi, crime, fantasy and drama, as well as animated series, history formats and documentaries. One of its lead titles, to be presented at the MIPTV trade fair, is Metal Hurlant Chronicles, a fantasy series adapting stories from the comic of the same name that has already been sold in more than 50 countries. The show stars Scott Adkins, Rutger Hauer, Michael Jai White, James Marsters, Michelle Ryan and Kelly Brooke, and with a line-up like that you have to wonder if Panini UK might not be eyeing this up as a possible comic title, which perhaps could include an element of new stories from British creators as well as reprinting Metal Hurlant tales. Let me stress right now that this is pure speculation on our part here at downthetubes and we are not privy to Panini's new title list! Some Metal Hurlant stories have, of course, started appearing in STRIP Magazine. Another Panini show is Signs, a drama written by Ysé Brisson. Julien Mutter, Randy Bradshaw, Patricia Harris Seely. Jordskott is a mystery crime series set in present time, though its starting point is the stories and characters from Scandinavian legends. “Panini Media aims to become a globally recognized provider of quality family entertainment and is very proud to be revealing our extremely exciting portfolio of titles at MIPTV 2012 under our new Panini Media banner," said Bruno Zarka, the head of Panini Media's sales and acquisitions. 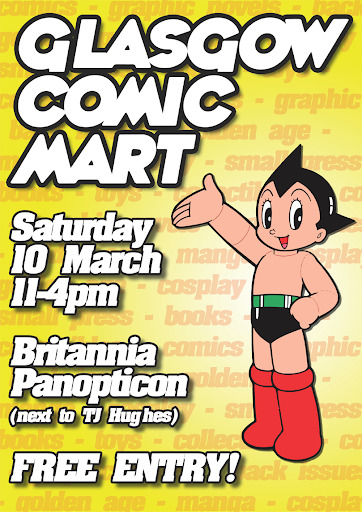 (with thanks to Gordon Robertson) A quick plug for today's Comic Mart at the Britannia Panopticon Music Hall, in Glasgow today. The world's oldest surviving music hall, the Panopticon was founded in 1857 on the Trongate and quickly became famed as being the most popular place of amusement in the city. 1500 people would cram themselves onto wooden benches for every show. The audience gained itself a reputation for "leaving no turn unstoned" and over the years the stage saw performances by such greats as Dan Leno, Harry Lauder, Marie Loftus, Charles Coburn, Harry Champion, W. F. Frame and of course, the debut of a sixteen year old Stan Laurel in 1906. At the turn of the millennium, the music hall was rediscovered and a team of dedicated volunteers continue to working towards the goal of ultimately restoring this unique and valuable little auditorium. Airing tonight (8th March) is Clear Spot: The problem of autobiography. In a panel discussion recorded at the First Fiction festival (Sussex University, January 2012) author Sue Eckstein discusses the problems inherent in creating autobiographies with graphic novelists Nicola Streeten and Anuerin Wright and how creators can subvert and overcome these. Nicola's book Billy, me and you and Aneurin's Things to Do in a Retirement Home Trailer Park couldn't be more different in their approaches, with the former combining cartoons, diary drawings and scrapbook montage and the latter depicting the author's friends and family as anthropomorphic creatures in domestic settings. Later this month Comics Forum and the organisers of the Thought Bubble convention will be running an evening event in Leeds to discuss the philosophical questions posed by comics. 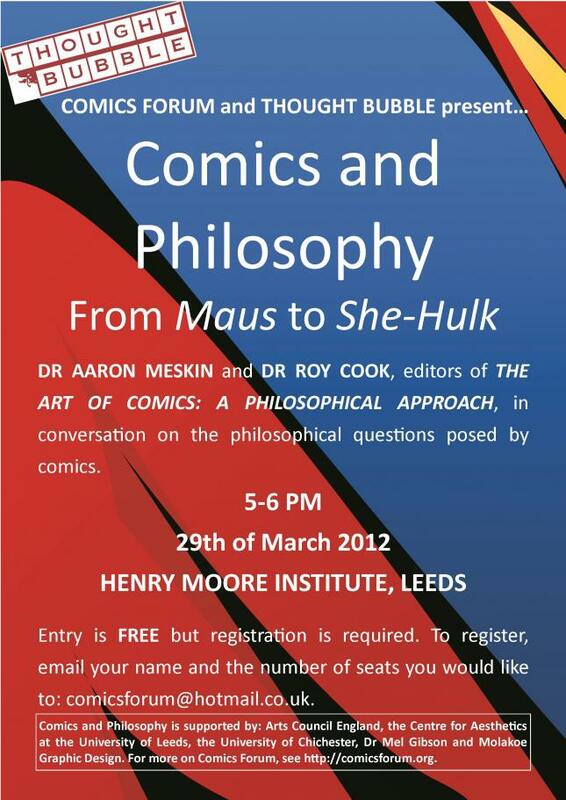 The speakers at ‘Comics and Philosophy: From Maus to She-Hulk’ wil be Aaron Meskin and Roy Cook, editors of The Art of Comics: A Philosophical Approach and the event will take place from 5-6.00pm on the 29th March at the Henry Moore Institute in Leeds. Aaron Meskin is Senior Lecturer in Philosophy at the University of Leeds and the author of numerous journal articles and book chapters on aesthetics and other philosophical subjects. He was the first aesthetics editor for the online journal Philosophy Compass, and he co-edited Aesthetics: A Comprehensive Anthology, published in 2007. He's a former Trustee of the American Society for Aesthetics and Treasurer of the British Society of Aesthetics. Roy T Cook is an Associate Professor of Philosophy at the University of Minnesota, a Resident Fellow of the Minnesota Center for Philosophy of Science, and an Associate Fellow of the Northern Institute of Philosophy (Aberdeen). He works in the philosophy of logic, the philosophy of mathematics, and the aesthetics of popular art. He blogs about comics at: www.pencilpanelpage.wordpress.com. 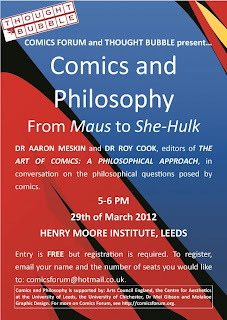 • To register for ‘Comics and Philosophy: From Maus to She-Hulk’ send your name and the number of seats you would like to comicsforumAThotmail.co.uk. The digital rights event ORGCon is back in London on Saturday 24th March 2012, at the University of Westminster. 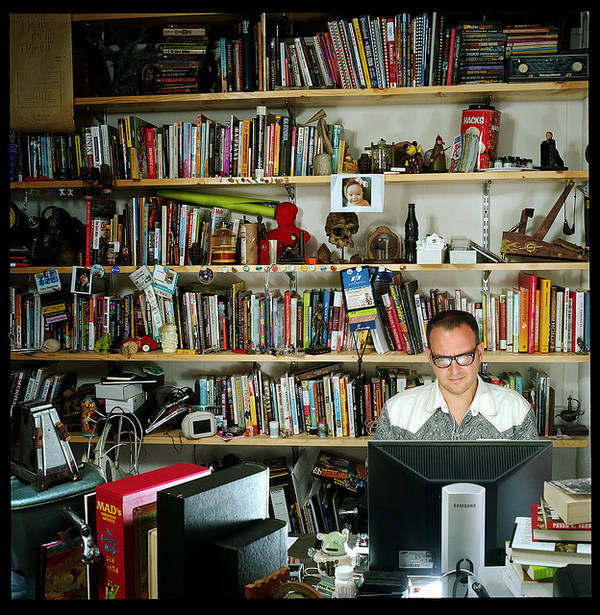 It's packed with exciting speakers, including author and comic creator Cory Doctorow, challenging debates, and workshops that will leave your mind exploding with ideas! Here's your chance catch up with everything digital rights related, while meeting the brilliant minds of Lawrence Lessig, Cory Doctorow, Wendy Seltzer, Ross Anderson, Tom Lowenthal, and many more. From the government snooping on your data to default internet blocking and monitoring to the corporate capture of state and democratic institutions - they'll be covering vast regions of the digital rights sphere. And there may even be a competition or two. 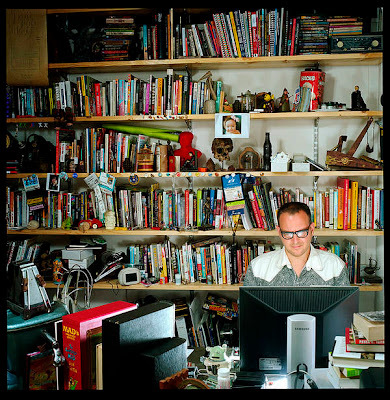 Cory Doctorow is a science fiction author, activist, journalist and blogger -- the co-editor of Boing Boing (boingboing.net) and the author of Tor Teens/HarperCollins UK novels like For the Win and the bestselling Little Brother. He is the former European director of the Electronic Frontier Foundation and co-founded the UK Open Rights Group. Born in Toronto, Canada, he now lives in London. His forthcoming books include Rapture of Nerds (a novel for adults, written with Charles Stross) and Anda's Game (a graphic novel from FirstSecond). • For a taster of what you'll be coming to take part in, have a look at these videos taken at the last ORGCon. • Book your tickets here by joining the Open Rights Group now and get a free Ticket, and a free copy of Heather Brooke's The Revolution Will Be Digitised. No More Heroes, a British self-published comic released just last week, is now amongst the most popular downloads on pirate sites such as Demonoid, ranking high in the “top torrents” list -- alongside the likes of other ilegal downloads such as The Walking Dead and Batman. 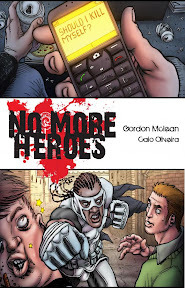 No More Heroes #1, written by Gordon Mclean and drawn by Caio Oliveira, is available to buy as a print and as a digital PDF edition, but a pirate version has been downloaded over 1600 times on Demonoid alone. Rather than see the theft of their work as a bad thing, the creative duo behind the comic are hoping to use this popularity to attract a publisher. “This has blown my mind, to be honest," says writer 31-year-old Gordon Mclean from Scotland. "I knew we’d made a good comic, but to see it become so popular so quickly is crazy. "Don’t get me wrong, I would have loved those 1600 sales," he emphasizes, "but I’ve decided to take it as a really positive thing that so many people want to read No More Heroes and word of mouth has been so good. The goal has always been to attract a publisher for our comic and we hope this proves there’s an audience out there for it. “You have to remember that this is a self-published comic by two unknowns with no marketing or advertising behind it. It’s been thanks to word of mouth and great reviews that it’s been generating a bit of a buzz. No More Heroes tells the story of Sid Millar, an average guy who receives an anonymous text message asking, “Should I kill himself?” Drunk and goaded by friends, he replies “Yes”. It turns out this text was sent by Dark Justice, the world’s greatest superhero, who has committed suicide. Or so the world thinks. Dark Justice’s sidekick believes his boss was actually murdered and forces Sid to help him with the investigation into the suspicious death. The comic is planned as a four issue mini-series - a mixture of the superhero and murder mystery genres with action and dark humour. While they have experience in the writing and illustrative industries respectively, No More Heroes is the professional comic debut of Gordon and Caio. “It was listening to Mark Millar give a talk at the Kapow Comic Festival promoting creator-owned comics that inspired me to make my own," Gordon reveals. "I had just been laid off and I used my redundancy money – and sold off my collection of Playstation games – to fund the comic and put together the best art team possible. • UK Customers: Issue 1 of No More Heroes is now available to buy for £3 plus £1 P&P. This is a limited print run and each issue is signed. • Non-UK Customers: For world-wide customers No More Heroes #1 is available for £3 plus £3 P&P. This is a limited print run and each issue is signed. • Digital Version: A digital version of No More Heroes #1 is also available and will be emailed to you in PDF format upon purchase. It costs £1. 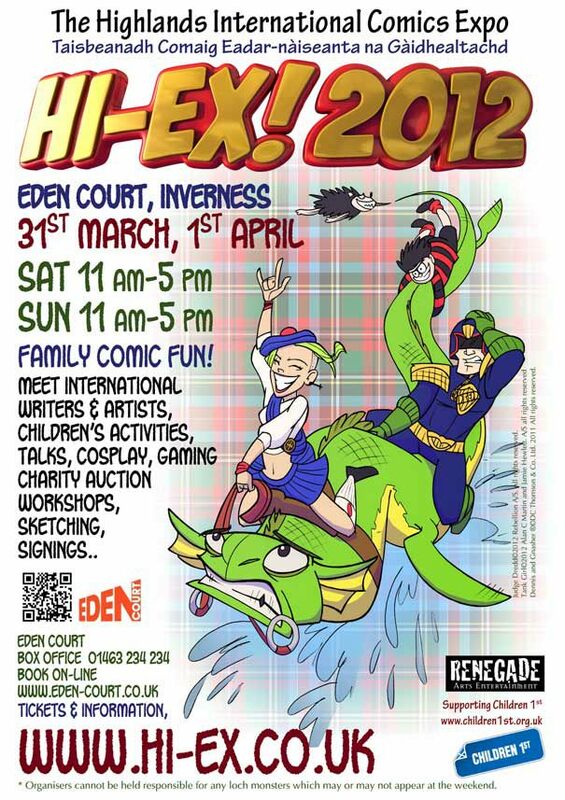 Last month, the UK hosted two Comic Conventions, one in Cardiff and the new Super Con in London.... on the same weekend. The clash clearly had an impact on numbers and the range of creators attending each, and now it would appear this might happen again in 2013. Rather than risk another clas, the Cardiff Expo has moved its dates to 2nd - 3rd March. "To let the new boys have some space we have moved the Cardiff Expo," says organiser Mike Allwood, "which means we are running the Cardiff Expo as near to St Davids Day as we can - and what better time to host it! 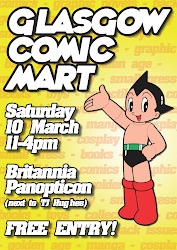 "Expect the same mix of Special Guests, Comics, Animation, Anime & Manga, Cosplay, Horror showcase, Small Press, Doctor Who and thoseEXpo EXclusives plus who knows what else we'll add! The Crusade that has been lost to history reaches its climax in The Fire Beaks, the fourth book of writer Jean Dufaux and artist Philippe Xavier's saga. The Crusader armies, now lead by the mercenary Lord Of Machines, mass against Hierus Halem. In the city the Saracen leader Sultan Abdul Razim and the Christian noblewoman he is in love with, Syria of Arcos, are visited by the mysterious Mufti of Alkar and they discuss how to prevent the oncoming battle. The Sultan allows Syria to return to the Crusader camp as he prepares to defile the Holy Sepulchre that the Crusaders are fighting for. Meanwhile Syria's former lover, Gauthier of Flanders, leads a Jewish army to Hierus Halem to help the Crusaders, however when they arrive there the death and destruction of the battle for the city has already begun. 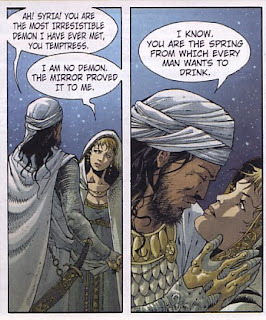 The previous three Crusade books have been both delightful and frustrating in equal measures, delightful for Xavier's artwork which highlights both the supernatural sections of the plot and the dynamism of the battles, and frustrating as the complex plot separated its main characters early on, giving them very separate journeys before bringing them back together for this final battle. The synopsis above merely scratches the surface of what is going on in the 48 pages of this book. Dufaux's story really needs to be read as one long four section saga rather than as four individual books and I think that the threads of the story will bind together better that way rather than read over a longer period - Cinebook have only taken a year to publish all four titles in the series, it took Le Lombard in France two years. The irony of the plot in this book is that while the Crusaders want Hierus Halem (Jerusalem) for themselves, the Master of Machines is only interested in the city as the means to an end, that of acquiring the region beyond it known as the Fire Beaks. The significance of the, until then unexplained, Fire Beaks is left to virtually the final page of the book and it will raise a wry smile in the reader. 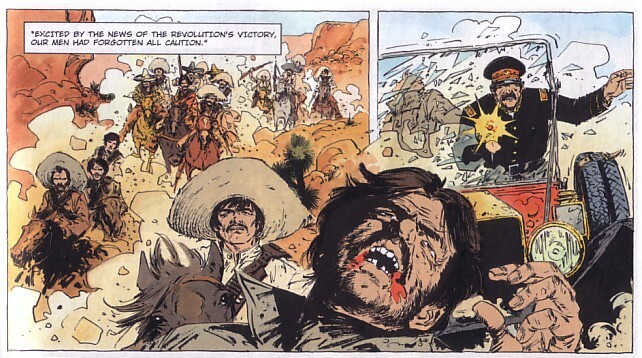 Rereading the four books would not be as big a chore as it may sound due to Philippe Xavier's lovely artwork throughout. Xavier's covers are amongst the most striking of any of Cinebook's titles and the way he uses his panels in the battle sequences remains as striking here as it was in the first book. I certainly look forward to seeing if Cinebook decide to publish anymore titles illustrated by Philippe Xavier and there are another two Crusade titles already published in France which begin a new story cycle for Gauthier. 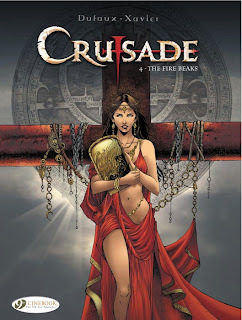 Crusade - The Fire Beaks with its lovely artwork and intriguingly complex plot brings this supernatural saga to a fitting climax which is both political and bloody in fairly even measures. 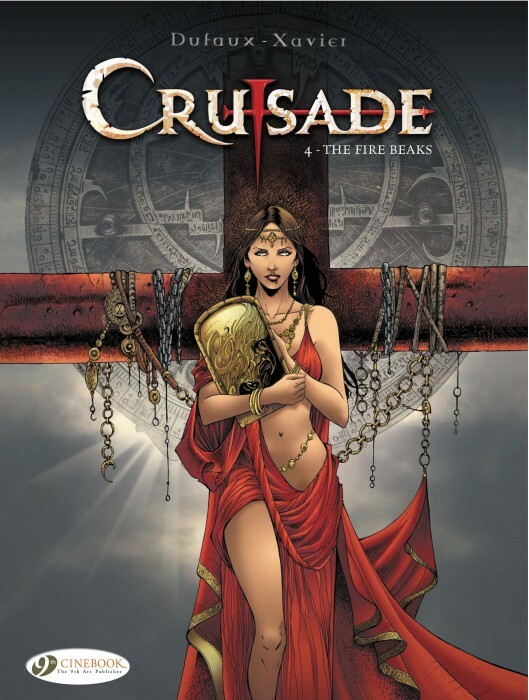 • The are more details of the Crusade books on the Cinebook website. • There are more details of the original Croisade books on Le Lombard website (in French) including details of the fifth and sixth books in the series. Comics Forum launches "scholar directory"
Today sees the launch of a new resource on the Comics Forum website. The scholar directory provides information on the biographies, research interests, conference papers and publications of scholars researching comics from around the world. The site runners tells us the hope is this will be useful in helping scholars to make connections, see where people are studying and what they’re interested in, and increase the accessibility of comics scholarship for everyone. Until today, the directory has been running in a limited pilot phase, with invited parties submitting their data for inclusion so Comic Forum could work out how to build the pages and structure the system. Many thanks to all those who agreed to take part in this trial run. Now, all comics scholars are being invited to fill in our data form and submit it to comicsforumAThotmail.co.uk for inclusion in the listings. "It would be great to build a better picture of who is where," says Ian Hague, director of the Comics Forum. "Any queries about getting listed can also be directed to the above email address." Any comments on the directory are very welcome. If you know of anyone who would be interested in being listed in the directory, please pass on this news story to them. • To be taken to the directory and download the data form, go to: http://comicsforum.org/scholarly-resources/scholar-directory/. 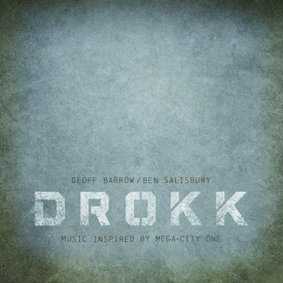 Musicians Geoff Barrow and Ben Salisbury are to release Drokk in May - an album inspired by Judge Dredd's 2000AD home town, Mega-City One. Geoff Barrow is a founding member of Portishead and producer/label owner of Invada Records UK. Ben Salisbury is a soundtrack composer with over 200 film and TV credits to his name, including David Attenborough’s Life of Mammals, Life in the Undergrowth and Life in Cold Blood. Set up by Geoff and Paul Horlick aka Fat Paul "to lose money friends", Invada Records strives to showcase the finest in experimental music, from kraut rock to hip-hop, taking in doom, post-rock, metal and noise along the way. Don't expect genre-specific releases, they're out to promote underground gems you'll struggle to find elsewhere. Barrow and Salisbury met over 10 years ago when they both joined a Bristol football team for old men. After many disastrous games they decided they might be more productive working on a music project together. When Barrow and Salisbury revisited and started expanding upon this early material they decided to continue writing what was essentially soundtrack music. Barrow, along with album designer and long term friend, Marc Bessant, were both avid 2000AD readers from a young age, and the sprawling metropolis and classic stories of Mega-City One seemed the ideal inspiration for this ‘soundtrack’. Although Mega-City One has been brought to life in great detail over many years by the acclaimed work of writers and artists alike, the creators of Drokk feel there is still huge scope for readers to have their own vision/soundtrack of the city. Rather than intending to be the definitive sound of Mega-City One (could there be a ‘definitive sound’ of a city so vast, changeable and varied? ), Drokk is Barrow and Salisbury’s personal, outsider’s’ interpretation. Drokk was written in a six month period between Barrow’s Portishead world tour and Salisbury’s composing jobs for the BBC. Although it is a soundtrack of sorts, Barrow and Salisbury instinctively felt that music for MC1 should steer clear of the rich orchestration common to many contemporary film scores. Even for electronica, the music is often purposefully stark and spare, with the majority of tracks created exclusively on the Oberhiem 2 Voice Synthesizer (a 1975 classic keyboard), and its onboard sequencer used to create rhythm and drums sounds. The only exceptions are a handful of tracks which combine the synth with digitally manipulated and time - stretched performances of acoustic instruments (such as piano, violin, mandolin, ukulele, voice and hammered dulcimer). There is also a brief cameo from Barrow’s other band, BEAK. We're told Tharg is delighted by the new album. "2000AD is delighted that Judge Dredd continues to inspire artists in the year of the character’s 35th anniversary, especially such high profile talents as Geoff and Ben," said one of his droids. " You can tell, from their vision of the Big Meg, that they’re massive fans of the strip." Book 1 - Mr Alan Smith? Books 2 and 3 - Captain Steve Rowland? Book 4 - Corporal Ross Tanner? Book 5 - Agent Jason Fly? Books 6 and 7 - Writer John Fleming? Book 8 - Agent Jason McLane? Book 9 - Arms Dealer Karl Meredith? Book 10 - Revolutionary El Cascador? XIII - Three Silver Watches is about to tell us, at least from the point of view of his family history. 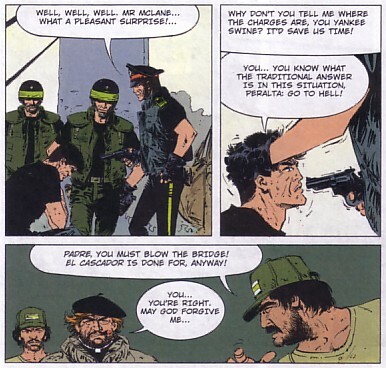 The revolution in Costa Verde is over and XIII's wife from his previous life, Maria, is now in charge just in time to discover that the former regime's military commander is planning to attack the capital with the remainder of his troops to take back the country. Maria orders XIII on a suicidal mission to blow-up the one bridge that the tanks must cross over to reach the city. American Sean Mullway goes with him and, as they travel towards the bridge, he uses the time to give XIII the history of his family beginning with three Irish friends who travelled to America to find their fortunes, married three sisters and who were each given a silver watch by their father-in-law. 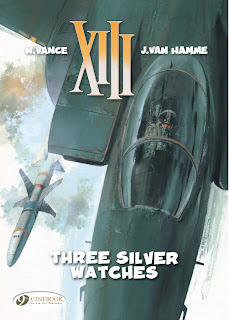 From the first XIII book showed us all the covers and English titles for the 19 books in the XIII series, this particular book has always intrigued me - just what does the F-15 Eagle air-superiority fighter launching a Sparrow air-to-air missile on its cover have to do with three silver watches? The quick answer is - nothing. This is a book of two parts, the part in which XIII must lead a small team to destroy a bridge in Costa Verde that will prevent a column of tanks starting a counter revolution, and the part in which Mullway tells XIII a century's worth of his family history. It is the family history that is the most intriguing since the bridge plot, which by the characters' own admission sounds like a war film, only serves to give XIII something to do as he listens to the story of his family. Indeed this sequence in the book is not helped by the F-15 being the wrong aircraft for the job firing a Sidewinder missile that, as well as being a different missile to the one on the cover, couldn't do what the plot needs it to do. It is the first time in 11 books that writer Jean Van Hamme and artist William Vance have made such a major mis-step in the technical hardware of the series. 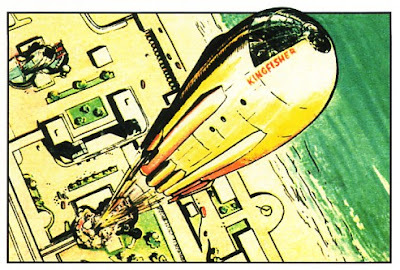 Vance's art is as accurate a depiction as reader's have come to expect of him which, ironically, is why I can say that the missile is the wrong type. While Van Hamme throws in a couple of the staples of the XIII series - Major Jones being able to fly any aircraft that is put in front of her as well as proving once again to be seemingly indestructible, Vance is able to add one of his own as yet another fight takes place in the rain. However for all the talk of bridges, planes and missiles, it is the family history that is the main part of this book and a major data dump as regards XIII the man. It begins slowly, almost like the "begats" at the beginning of the New Testament, where we were are inundated with names, marriages and children in a way that does make the reader wonder just where it is heading and if it might actually get interesting at some point. Then all of a sudden the three brothers are fighting for first one side and then the other in the Mexican civil war and the surnames of characters from earlier XIII books are introduced and previously unknown family relationships between them and XIII are established. XIII the strip first appeared in issue 2408 of the weekly Spirou comic magazine in 1984, while this book was first published in French over ten years later. Had Van Hamme worked out the family relationships of his on-going plot at the beginning or, as the titles in the series sold well enough that the series was bound to continue, did he construct at least part of this family history around what he had already written? In all probability is the latter of these and this book, for all its flaws, just goes to show how skillful a writer he can be. XIII - Three Silver Watches brings a new depth to the XIII saga and, with its new links to many of the series already established characters, presumably sets the scene for encounters yet to come. While the XIII books always leave me wanting to read the next in the series, this one leaves me wanting to reread it again to make sure that I have all this background information straight in my mind before I move on to those next books. • You can read an interview with Cinebook publisher Olivier Cadic and XIII translator Jerome Saincantin on downthetubes at XIII Questions About XIII. At a time when high street retail is proving challenging - to say the least - it's good to hear of a new British comic shop opening. 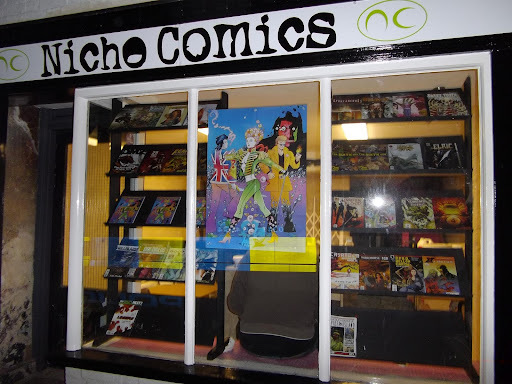 Niche Comics is a shop selling the latest in Comics, Books and games - including miniatures and products for Games Workshop, Wizards of the Coast and White Wolf. Located at 147 High Street, Huntingdon, Cambridgeshire, it's run by Adam and Guy Makey, who encourage their customers to browse and share ideas as well as join in the various events. The shop looks Victorian from the outside but the back is Tudor and plenty of the original building still remains - and the owners spent a lot of time restoring it, as they reveal on their web site. "Inside the first impression we had was straight walls with a step down to some changing rooms (after all it had been a Boutique)," they say. "The shop has always had a great welcoming atmosphere and originally we planned to replace the lighting and give it a fresh coat of paint. But behind the plasterboard (and in some cases two layers of plasterboard) lurked a building that has been around for 500 hundred years. So instead of Victorian, the team discovered many of the arcitectural trappings of a late Middle Ages/early Tudor dwelling. "Great oak timbers, elm, wattle (thin strips of oak), daub (mud and other stuff...), lime mortar and the occasional nail make up the fabric of the original building," they reveal. "You can still see the joints as they were first made and the care taken to neatly finish the walls. "So the decision had to be - do we make do and open the shop quickly and leave it to feel like any ordinary shopping experience, or do we renovate it with natural materials and ensure it lasts for another 500 hundred years and is a shop alive in every sense of the word?" It is with sadness that we have to report that artist Bruce Cornwell passed away on Friday 2nd March 2012. Bruce was best known to fans of British comics as one of the original Dan Dare artists in Eagle in the 1950s when he was part of Frank Hampson’s Dan Dare studio with his forte being the technical aspects of the hardware and spaceships. Dan Dare may be the work that he is best known for but he also produced such comic strips as Sammy In Space in Swift, Danny Dare in Wham, and Space Captain Jim Stalwart in Junior Mirror. 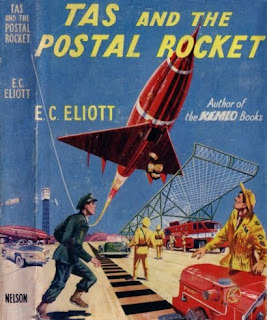 His work stretched beyond comics into book illustration with many painted colour covers as well as internal line illustrations for books in the 1950s and 1960s including the two junior science fiction series written by EC Eliott, Kemlo and Tas. 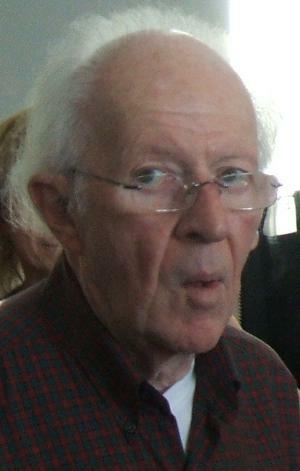 In addition to comics and books he did commercial work for various organisations and companies including the General Post Office and the glass manufacturer Pilkington.In recent years, along with other Dan Dare artists of his era, he was persuaded to come out of retirement and contribute to Spaceship Away for which he produced Dan Dare themed paintings. Indeed the current issue of Spaceship Away, number 25, has a lovely painting by him of Dan’s spaceship, Anastasia, flying over Space Fleet Headquarters with the sea in the background. 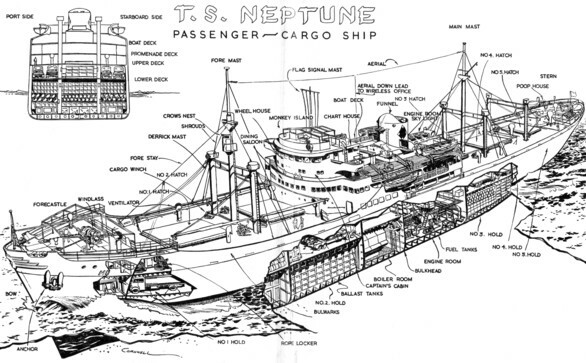 As a former merchant seaman, Bruce’s love of the sea could be seen in the colour cutaways that he produced for Eagle which were invariably of ships while, in 1953, he wrote and illustrated one of the Educational Supply Association’s People’s Jobs series of books entitled The Ship’s Crew. This gave the details of a fictional cargo ship, the TS Neptune, loading cargo, crew and passengers in the UK before setting off on its voyage and was illustrated with black and white line drawings and various cutaways of the ship. We make no secret of the fact that here on downthetubes we are Dan Dare and Eagle fans: John Freeman was editor of the Titan Dan Dare reprint books, Ian Wheeler was editor of the Eagle Flies Again fanzine, Richard Sheaf writes for Eagle Times, the journal of the Eagle Society, while I also write for Eagle Times as well as Spaceship Away. In recent years I had the opportunity to correspond with Bruce and he helped me out with information and quotes for a series of articles I wrote for Eagle Times on his non-Dan Dare comic strips. He was generous with his time while his memory of events, people and his work from more than half a century beforehand was quite remarkable. On behalf of the team here at downthetubes, John, Ian, Richard and myself, may I offer our sincere condolences to Bruce’s family and friends at this time of sadness. We're sorry to report the passing of SF visionary Ralph McQuarrie, aged 82. Along with artists such as Chris Foss, Roger Dean, Frank Bellamy and Mike Noble, Ralph McQuarrie's singular vision was another influence in my love of SF art that continues to this day. His design work on the original Star Wars universe and the orignal Battlestar Galactica TV series will be most remembered by many, but he also brought his singular vision to other creations, even if some were not used - a remake of Forbidden Planet, for example. His contribution to SF art is and always will be, immense. His influence on many young artists, inspiring them to follow in his footsteps, is incalculable. 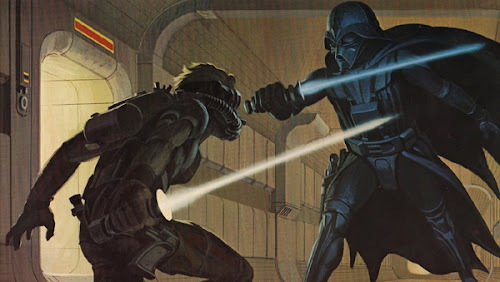 "It is with the deepest sadness that we announce the passing of Ralph McQuarrie. "People say you should never meet your heroes. Ralph was the exception to that rule. We were all fans of his amazing art long before we were blessed with his friendship. But once you got to know Ralph it was impossible not to become a fan of Ralph the man. "Ralph was a very special person for many more reasons than his undeniable brilliance with a brush. He was an especially kind, sensitive, deep, modest, funny and fascinating gentleman. And as fine a role model as any one could have wished for. 'that looks like something Ralph McQuarrie painted.'" He will be much missed and our thoughts go out to family, friends and all those whose work he influenced on this sad day. Aren't you glad that they let us call it Hi-Ex? 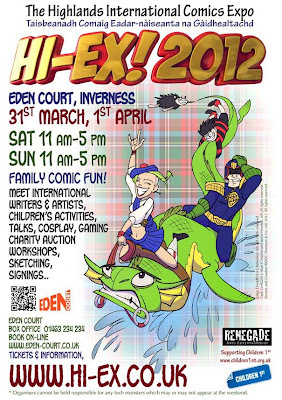 A reminder that the Highlands International Comics Expo will be taking place at Eden Court on the banks of the River Ness in Inverness itself on Saturday 31 March and Sunday 1 April. Doors open from 11am to 5pm each day. Guests include artists Cam Kennedy, Nigel Dobbyn, Tanya Roberts, Gary Erskine and Chie Kutsuwada, writers Maura McHugh, Al Ewing, Jim Alexander, Ferg Handley and Michael Carroll, plus downthetubes' own John Freeman in his not-so-secret identity of editor of STRIP Magazine.